In the beginning of the 2016 campaign the only one of Donald Trump's five children with a high public profile was his daughter Ivanka who has her own celebrity brand just like her father's. The two older sons were unknown to the general public but they made quite a good first impression when the whole family appeared on a CNN family special. They are all so attractive and glamorous that many people came to believe they were Donald Trump's best feature. Indeed, it was said that the fact he'd raised such an admirable family spoke so well of him that it smoothed some of the rough edges of his own personality. 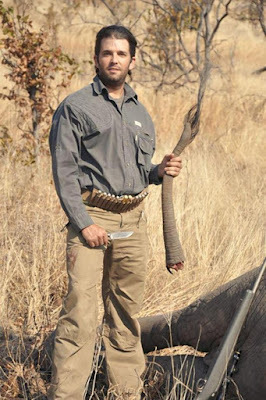 Unfortunately, as people have gotten to know them better, they've revealed themselves to be as rough edged as dear old Dad, particularly his namesake, Donald Jr. When Donald Jr spoke to a white supremacist radio host in March it set off a few alarm bells simply because his father's extreme immigration policies had been so ecstatically received by white nationalist groups. But most chalked it up to inexperience and let it go. Surely Junior wasn't as crudely racist as the old man who was reported to keep a book of Hitler speeches next to the bed. But just a few days later he retweeted a racist science fiction writer named Theodore Beale who goes by the handle of "Vox Day" claiming that a famous picture of a Trump supporter giving a Nazi salute was actually a follower of Bernie Sanders. The apple didn't fall far from the tree after all. Since then it's been revealed that he follows a number of white nationalists on twitter and he's retweeted several including a psychologist who believes Jews manipulate society. And in the last couple of weeks Junior has let his alt-right freak flag fly. First he got excited about Hillary Clinton's "deplorable" comment and proudly retweeted a picture with the title "The Deplorables" that had been making the rounds featuring Trump, Mike Pence, Rudy Giuliani, Chris Christie, Ben Carson, Eric Trump and Donald Jr along with conspiracy theorist Alex Jones, right wing hit man Roger Stone, alt-right leader Milo Yianopolis and white supremacist symbol Pepe the Frog. There's no indication that any of them had a problem with that but a lot of other people found it to be revealing, to say the least. A couple of days later Trump Jr stepped in it again, saying the media would be "warming up the gas chamber" for Republicans if they lied and cheated the way Hillary Clinton does. He claimed he was talking about capital punishment but his association with virulent anti-Semites makes that claim ring a little bit hollow. And then there was the Skittles incident. Donald Jr tweeted out a deeply offensive image of a bowl of skittles with the words "If I had a bowl of Skittles and I told you three would kill you would you take a handful? That's our Syrian refugee problem." It's a terrible metaphor, wrong in every way and Donald Jr took some heat for it. But it's yet another window into his association with alt-right white nationalism. That bad metaphor has been around in various forms for a long time. In this country it was usually a bowl of M&Ms representing black people. The people who traffic in this garbage fairly recently changed it to Skittles because that was the candy Trayvon Martin had bought on the night he was murdered by vigilante George Zimmerman. Yes, it's that sick. "If we had a bowl of Skittles on this table, and three of the 1,000 in there were poisonous, would you take from the bowl? You wouldn't until you could figure out which ones were bad." You hear pundits and commentators saying that Donald Trump is sui generis and his phenomenon won't be recreated. They're probably right. But perhaps they are not aware that his son also has political ambitions and he is simply a younger, better looking version of his father with much more hair. If alt-right white nationalism is going to be an ongoing feature of American political life, they have their leader. He is one of them.